The proposed state budget could cut Temple’s state appropriations in half for next year. Temple Student Government Student Body President Natalie Ramos-Castillo spent a majority of her spring break talking to students who may not be coming back to Temple next year if Gov. Tom Corbett’s proposed budget passes through Pennsylvania’s General Assembly. 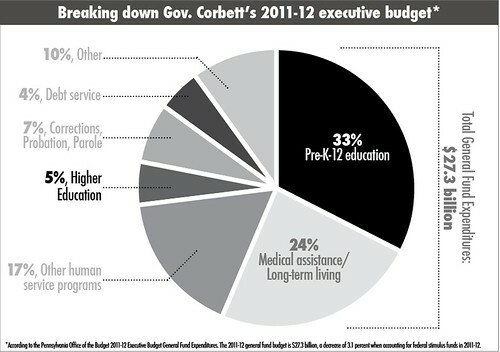 Four days into spring break on March 8, Corbett announced, among other cuts, Pennsylvania’s four state-related schools’ state appropriations would be cut in half in his budget for the 2011-12 fiscal year. Under Corbett’s budget, Temple stands to receive approximately $82.4 million from the state next year – down from the $178.5 million it received this year. Approximately $7 million of this year’s figure came from the American Recovery and Reinvestment Act of 2009. On Wednesday, President Ann Weaver Hart will travel to Harrisburg, Pa., to testify in front of the Senate Appropriation Committee. Hart, along with the leaders of Penn State University, the University of Pittsburgh and Lincoln University, will continue to make the case for higher education. Though the leaders of state-related universities were originally scheduled to testify March 28, the magnitude of the possible cuts to higher education pushed their testimony forward. “Because higher education took such a large cut in the budget, they wanted us to have a say on the first day of hearings,” Senior Vice President of Government, Community and Public Affairs Ken Lawrence said. A petition sponsored by the Temple Advocates Legislative Outreach Network urging citizens to “Stand with Temple” will eventually be presented to the House and Senate. Currently garnering 6,599 signatures as of press time, the goal is to reach at least 10,000. Executive Vice President, Chief Financial Officer and Treasurer Anthony Wagner emphasized the importance of people “understanding the magnitude of the problem” and getting involved. “We’re hopeful that we’re able to reduce the size of the cut through the legislative advocacy process, and we’re going to work very hard on that,” Wagner said. Despite the changed makeup of the General Assembly since the 2010 midterm elections, Lawrence said he thinks Temple will have “broad-based support” as the budget process moves forward. “Higher education has higher support in the Legislature,” he added. The Republican Party – Corbett’s party affiliation – won control of the House from the Democrats in the November elections and holds a 112-91 advantage. Republicans already held majority control of the Senate prior to the midterm elections. Aside from working on other advocacy projects, Ramos-Castillo traveled to Harrisburg, Pa., on March 14 to speak on a panel at the Pennsylvania Budget and Policy Center’s state budget briefing. At the briefing, Ramos-Castillo said she spoke to representatives not only about the importance of Temple, but also the significance of education to the state’s future. TSG will offer its phone lines to students who want to call legislatives and is working with TALON on a letter-writing campaign. TSG is also planning a citywide rally with high school students, the Philadelphia Federation of Teachers and Temple’s adjunct faculty, Ramos-Castillo said, noting the cuts do not just affect Temple and other state-related universities. Corbett’s budget proposes more than $1 billion in cuts for Pennsylvania’s public schools, which also includes the financially struggling School District of Philadelphia, the State System of Education comprised of 14 universities and community colleges. “It’s really shocking to see that as someone who’s supposed to be looking to protect and represent the state, [the governor] thinks it’s a good plan [to cut so much from education], and that’s what’s going to be best for the state,” said Ramos-Castillo, a senior education major. Though Temple braced itself for a cut as the budget address approached, Corbett’s deduction to state-related universities’ budgets came as an unwanted surprise. Wagner echoed Lawrence’s statement, noting that the hole in Pennsylvania’s budget meant Temple would receive less. However, Wagner said the university is not ready to release specific facts or figures. Retaining graduates in the area is one of the campaign’s main goals.